A serious pigeon problem is popping up in at least one Las Vegas neighborhood forcing a family to declare an all-out war. Sandy Love said the problem began a few years ago but now the pigeon population has ballooned in her neighborhood near Ann Road and U.S. 95. "Just the pigeons, it's crazy," said Love. "I mean, they are out of control now," she added. Love and her neighbors suspect someone is feeding the flying vermin nearby causing them to roost and poop -- everywhere. "This is my pigeon stick and it's to get rid of all of the pigeons under my solar panels," explained Love while holding a stick made of bamboo. Love says aside from from the pigeon poop and feathers, she's worried about her mother Liz Watson, 84, who suffers from Lupus. "I do not have an immune system," explained Liz Watson. "I have SLE lupus and I've had it for 30 years so I have to be super careful," added Watson. The Southern Nevada Health District said pigeons can pose a danger to people. A well-fed pigeon can produce up to 25 pounds of poop every year, according to the Southern Nevada Health District. The city of Las Vegas introduced an ordinance against feeding pigeons earlier this month, however a formal vote to enact the ordinance may not take place until October. A Las Vegas spokesperson said if passed, it would bring the city of Las Vegas in line with similar ordinances on the books in Clark County and Henderson. In the meantime, Love says she has fortified her home using pigeon spikes, gorilla glue, and a decoy owl. 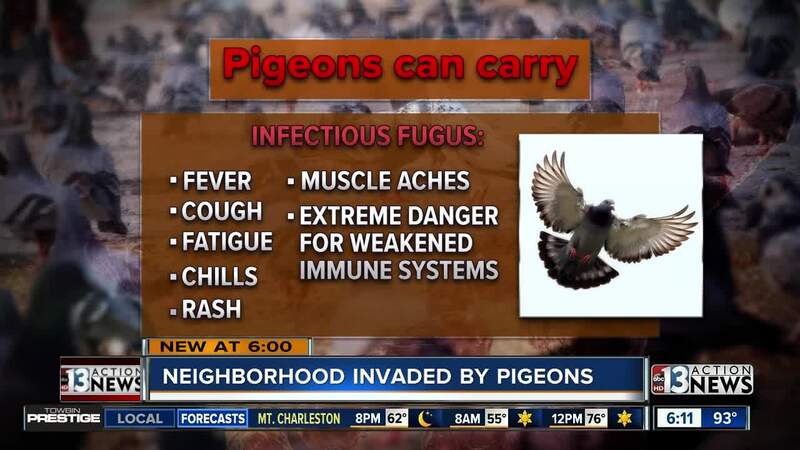 Authorities recommend consulting with a pest control specialist to tackle additional pigeon problems.